In this article we provide 20 Bed Frame designs that you can construct on your own, thus saving you a lot of money with a little effort. 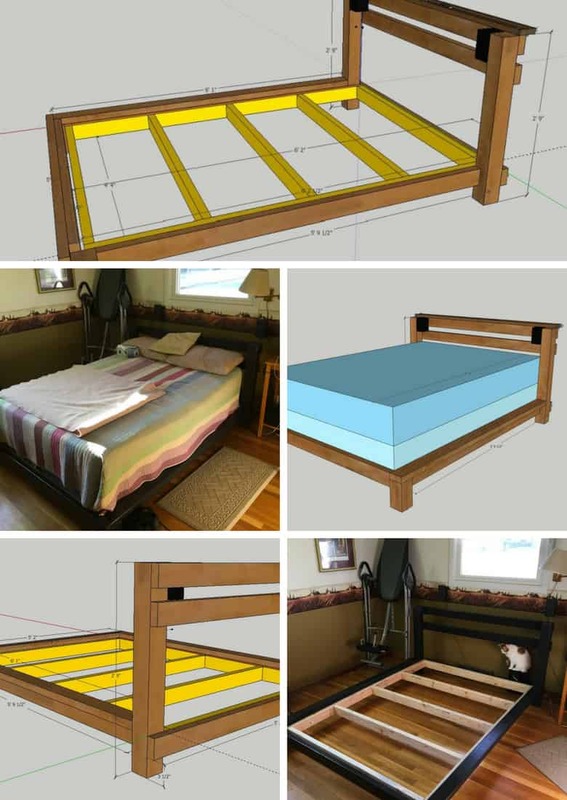 We have curated 20 DIY frames for your bed from instructables and have summarized each project below so that you will know what to expect when building each particular bed frame. You will find a lot of wooden designs (of course) using different types of lumber, pallet wood, reclaimed wood etc. In addition to wooden frames we feature also an aluminum frame from pipes. Moreover, you will find also different bed sizes such as queen size, full-size, single beds, toddler bed size etc. 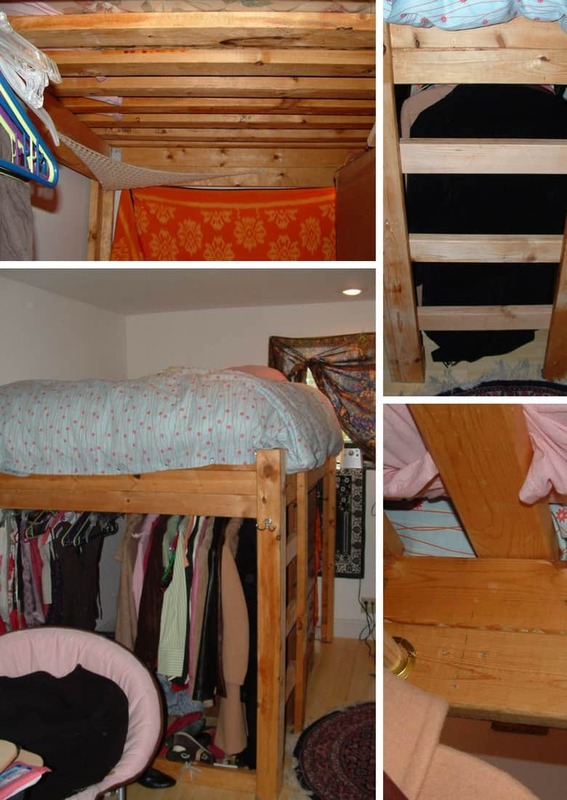 There are several DIY designs that take space saving into consideration (e.g elevated beds, bunk beds etc) and also include storage features such as drawers, desk space below the bed etc. This Bed-frame is a customized compact bed which comes with a reasonable price to build. 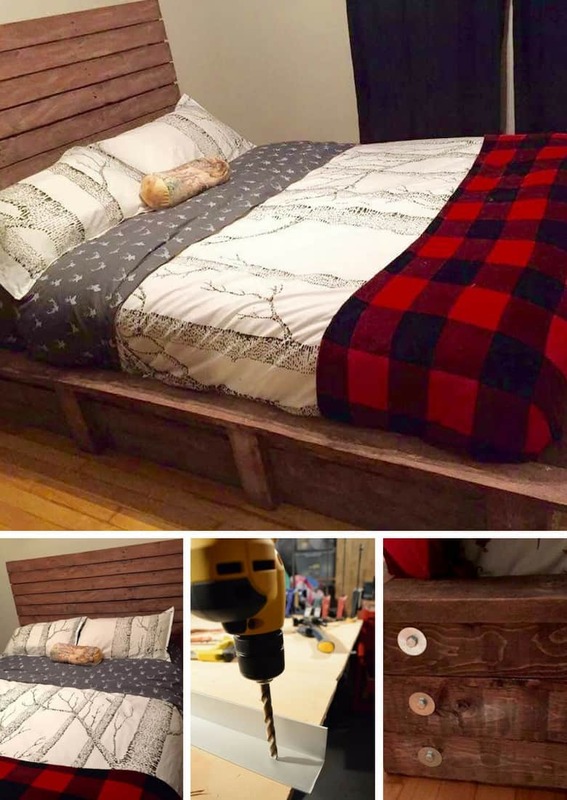 Commercial made wooden bed cost no less than $1000 market price and the quality and durability is a big issue even if you find something cheaper. 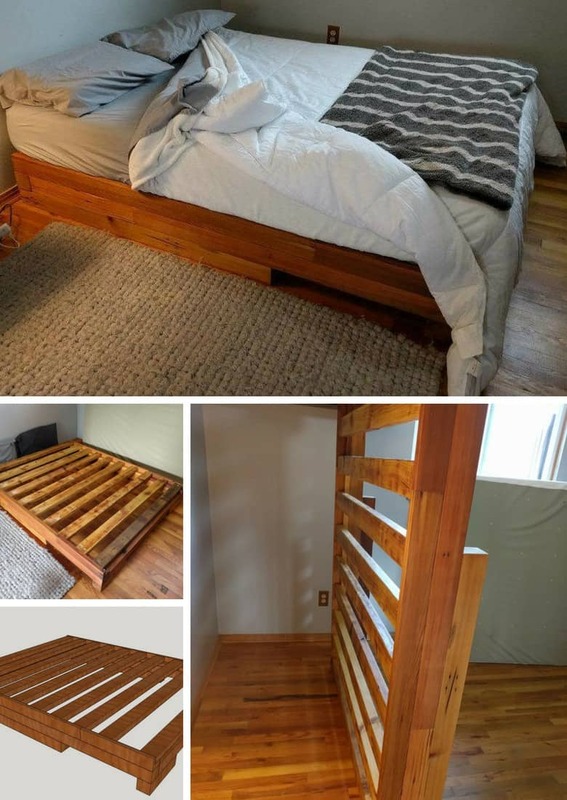 This is a DIY project and the dimensions of the bed may vary, as well. To build this customized bet, you need to shape the headboard, foot, sides, center support and the slats. You also need to build one headboard support and one headboard lining, as well. You can also bring variation in the design of the bed. At first you need to shape the individual components with appropriate measurements. 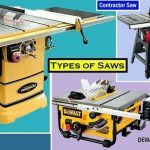 You will need tools like chop saw, table saw, cordless drill and electric plane to make the different components of the bed. Once you are done with that part you should concentrate on staining and varnishing the components and then start assembling the parts to make your bed ready. 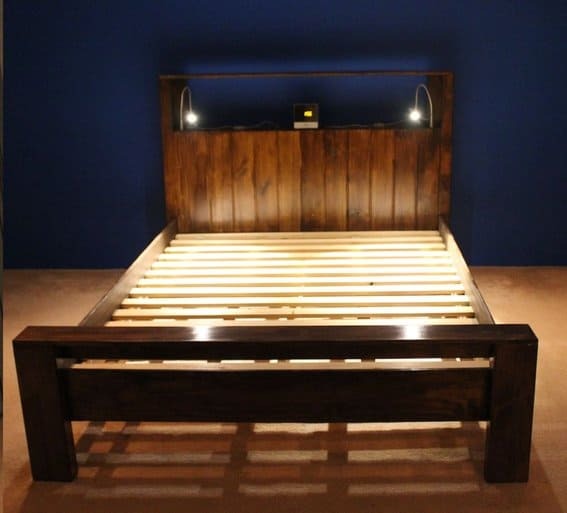 With some fancy lighting you can give the bed-frame an attractive look. 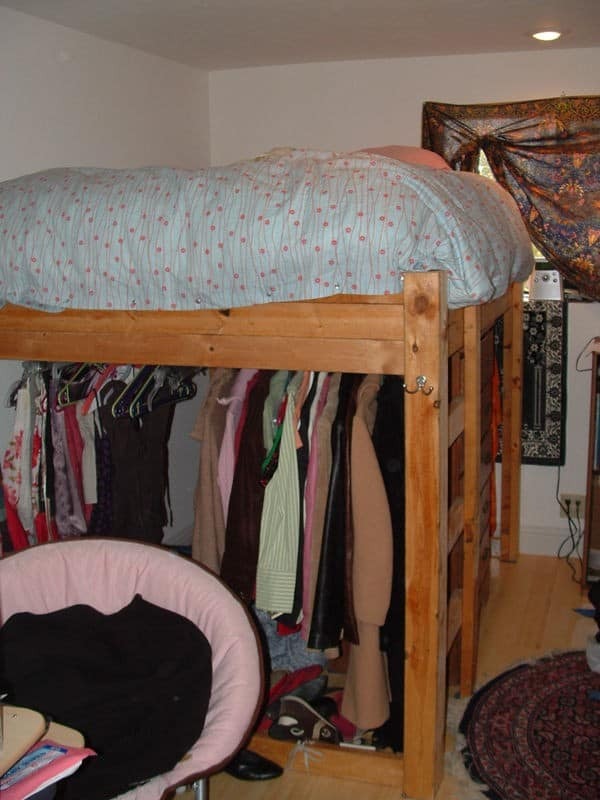 Elevated beds could be one of the best options to save space, which is required especially for a small sized apartment. For a double size mattress, you can go for a 54” by 75” physical dimension of the bed. 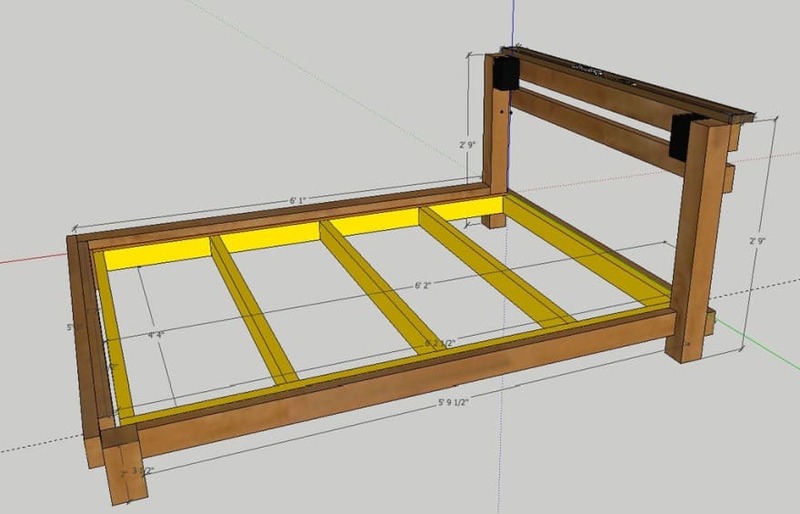 It is always a good idea to have not only the image of the bed but also some level of engineering sketch that will make your life easier while making your own elevated bed. 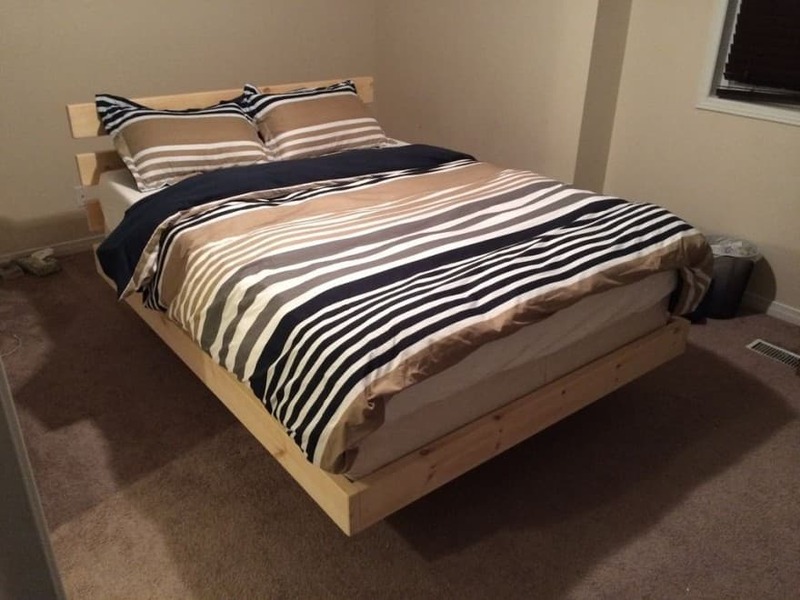 To build this bed, you need 2″x6″ lumber that goes with the mattress size and another 2″x4″ lumber depending on the height of the bed. Among some other accessories you also need to have 16 wood screws, 4 brackets and 16 hex nuts. After trimming the lumber, you need to drill 2 holes to join the two halves of your bed. After joining the frame, you need to add the legs, and you are done with your own elevated bed. 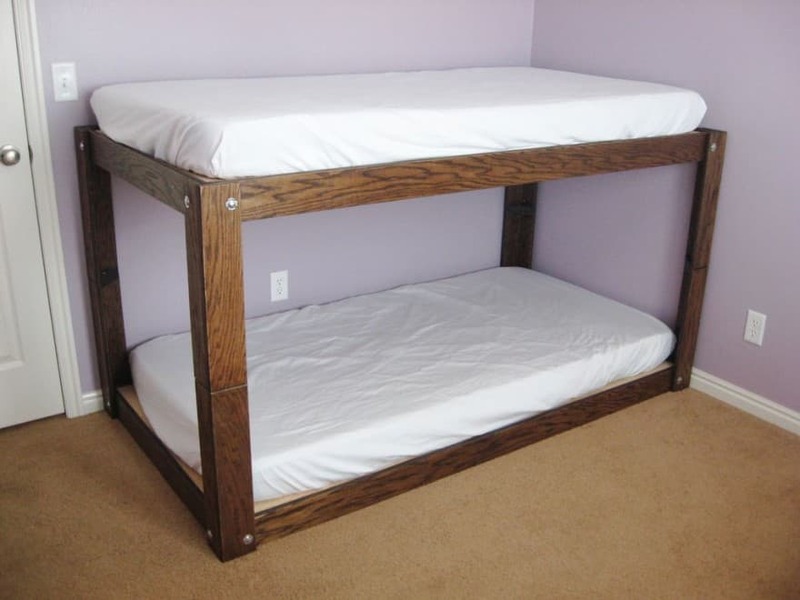 If you are looking for something simple yet looking nice, then you may think about making your own Beam-bed-frame. It is not only simple to build but also comes with a much cheaper price to make, which is around 50 euro, compared with other bed frames. To build this bed frame, all you need is 4 beams, saw, 4 L shape brackets, sanding paper, pallets, 8 flat brackets, wood varnish and screws. For a 160 cm by 200 cm mattress, you need to build a bed frame with dimensions of 170 cm by 210 cm. first you need to cut the frames following the appropriate measurement and then dying the woods. 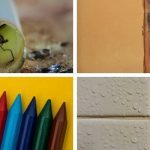 If you want to avoid the brush strokes on the frames, you may use a sponge to dye the frames. 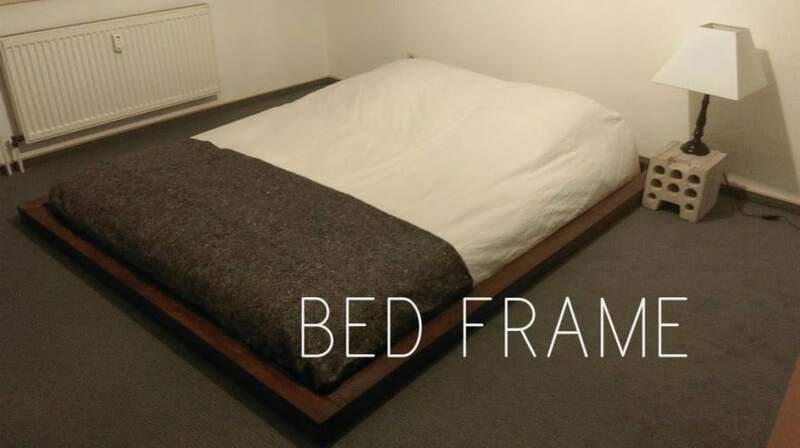 Once you are done with dying, you can now assemble the frames and get your customized beam-bed-frame. 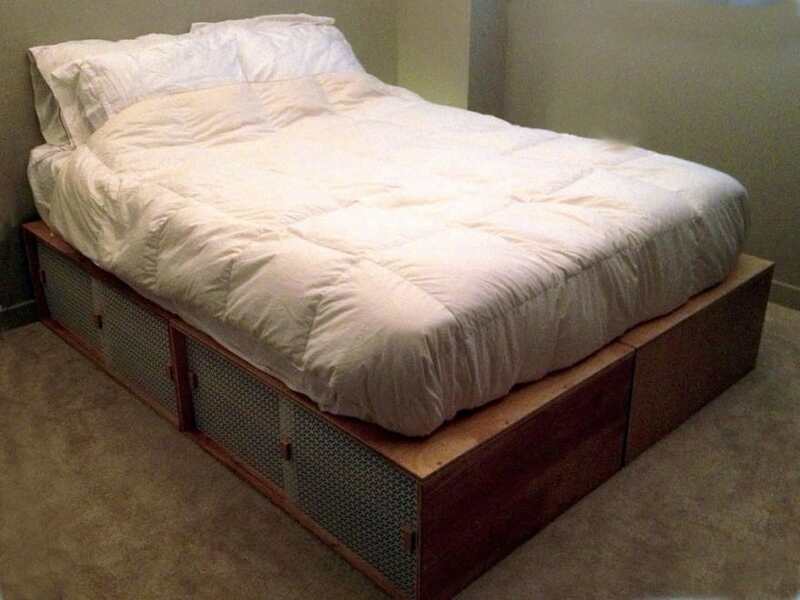 A bed frame with storage can utilize the space under the bed in a very effective manner. 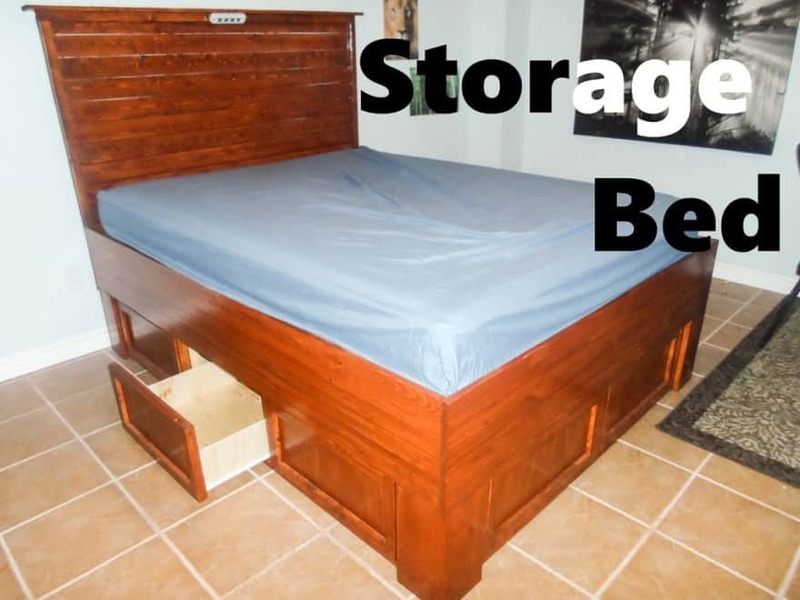 The retail price of a storage bed is around $1000 but the good news is you can build your own storage bed frame by spending only $300 to $400. For a queen size mattress which is around 60 by 80 inches, you may consider the frame of your storage bed as 61 by 81 inches. Some of the tools that you need to make your storage bed are table saw, measuring tape, hammer, painting supplies, drill, frame clap etc. First you need to build the legs of your storage bed and then the rails following the proper measurement. Once you are done with the legs and the rails, you need to attach the legs and then attach the clits. After that, you need to build the drawer frame and attach the drawer frame with the bed. Now, you need to add the false drawer front, drawer side frame and then finish the drawer fronts and attach the drawer slides. 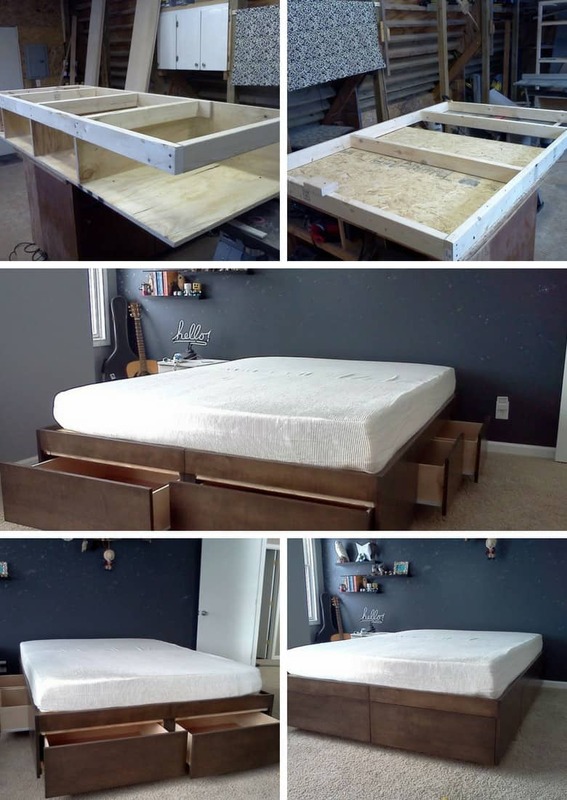 After doing all these, you need to build the headboard and assemble the parts and you have your own storage bed ready to use. 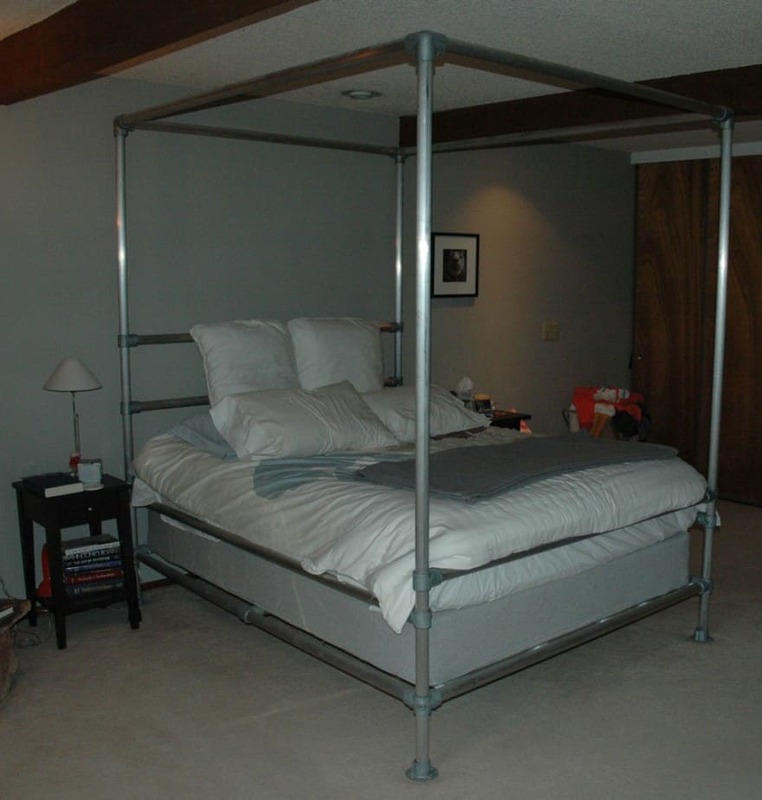 Have you ever thought of building your own bed which is handy to carry yet utilizes the space, as well? If the answer is yes, then surely you are looking forward to build your own box-bed. This special type of bed comes with four identical boxes and will be built considering the physical dimension of a queen size mattress which is 60” by 80”. You may also go for a single box bed and in that case you will need only two identical boxes instead of four. You may use good quality plywood for these boxes to reduce the cost. You may use a circular saw to cut the door track, the shelf and the base plane. Each side plane should have a 32” by 14” physical dimensions. Now you can put a coat of thin layer of glue at the edge of the boxes and then go for assembling the box to complete the box bed. What if you do not have any space to bring a new closet in your room but you need one? The solution is a loft bed. 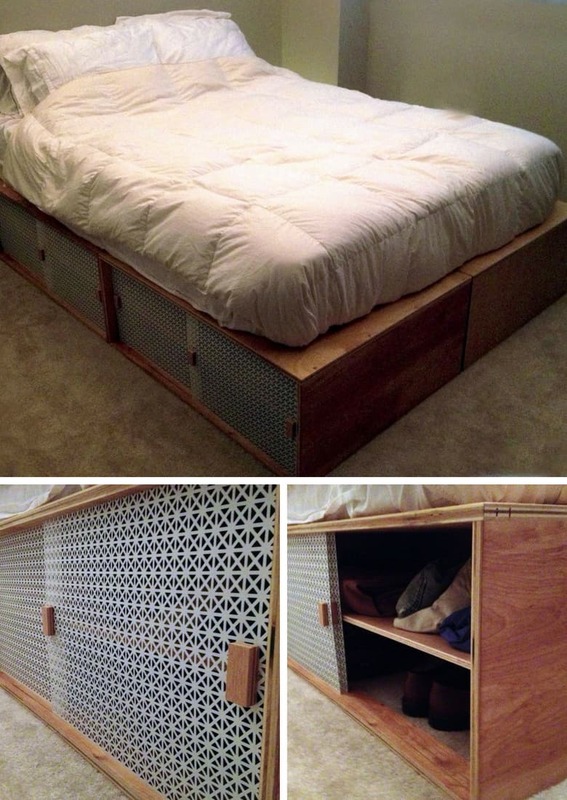 This is one very easy to build bed frame which also allows you to hang up your clothes beneath the bed, as well. Things that you need to build your bed are closet rod, hanging kit, deck screw, and brass lock screws. It is a good idea to sketch your bed before you start building it. You need to cut 5 long boards, 9 legs, 4 short boards and some slats. You also need to make a ladder and it is recommended not to use too much of space only to place the ladder attached with the bed. 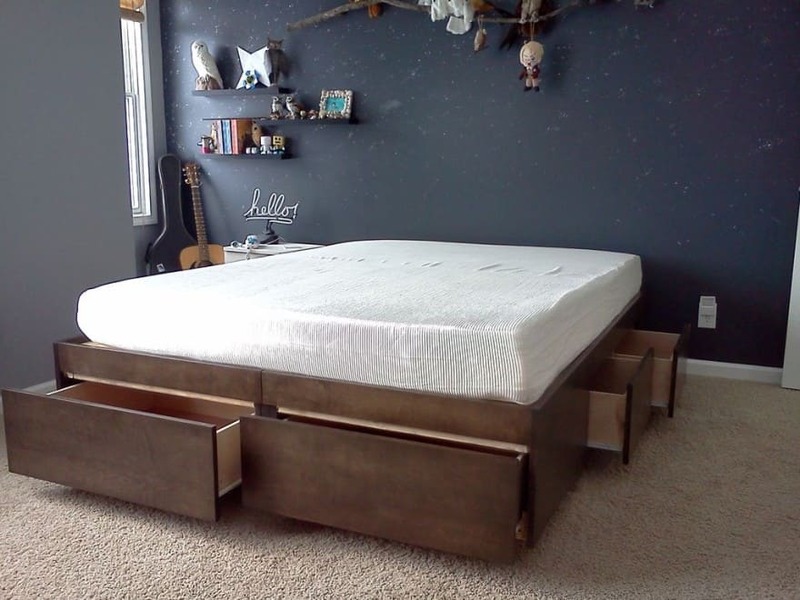 Once you are done cutting with the part of your bed, now you can assemble the parts using the bolts and put the thing together and you are done with your loft bed. 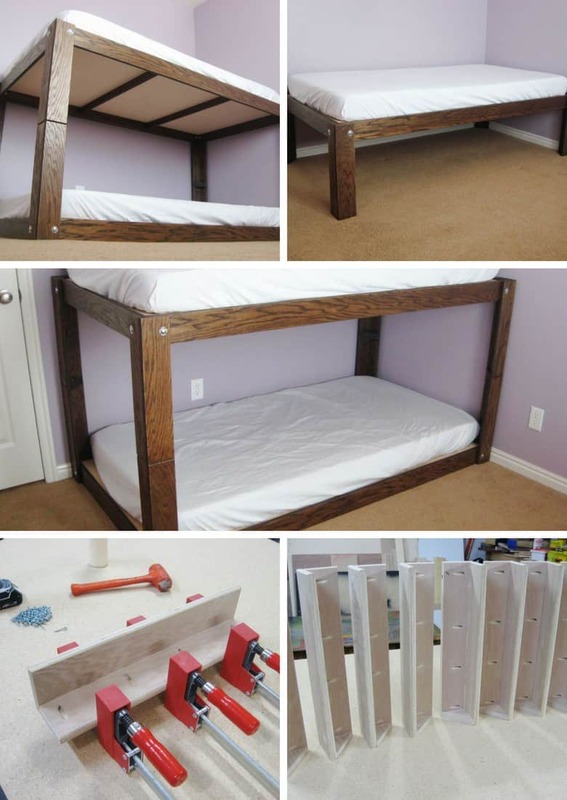 A Slotted bed frame is another simple yet nice looking DIY design. The physical dimensions of the slotted bed described here is for a full size mattress. At first you need to divide the length of the mattress into four equal parts and the height of the mattress into three equal parts to start working on the frame for your slotted bed. The best part of slotted bed is you do not need to use any screws or glue to join the parts of the frames. 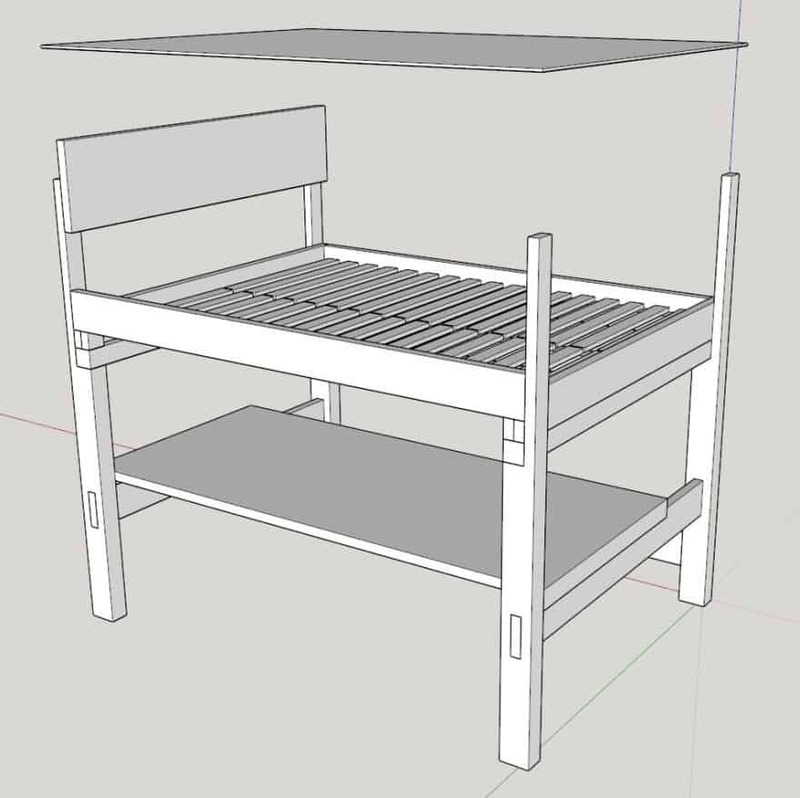 This bed is designed to have 12” gap from the floor and the interlocking slots will be placed inside to complete the frame. It is recommended to use plywood to make the frame of this design. You also need to add exterior perimeter and then add the box joint leg pieces to complete your slotted bed. 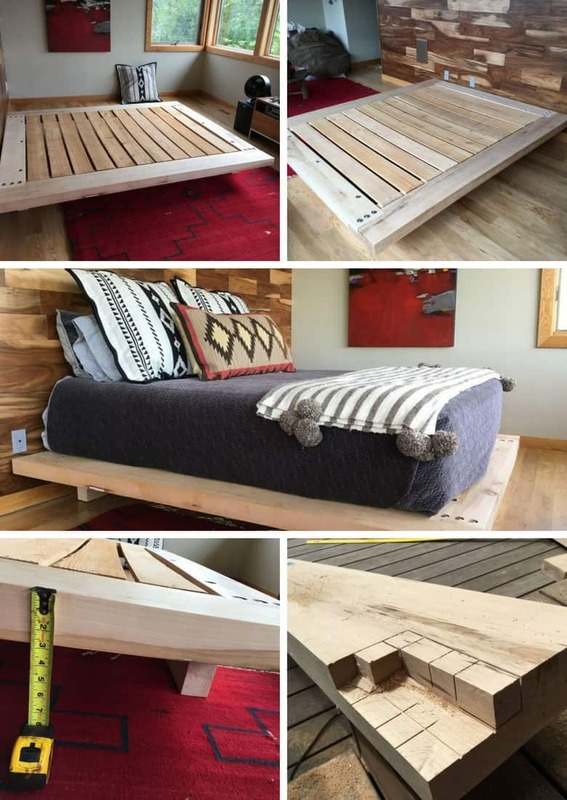 A bed frame from palettes is another easy to build DIY idea, which can also save you money if you go forward to build this bed by yourself. It would be great if you can manage to get a box spring and assemble the main frame of the bed on top of that. 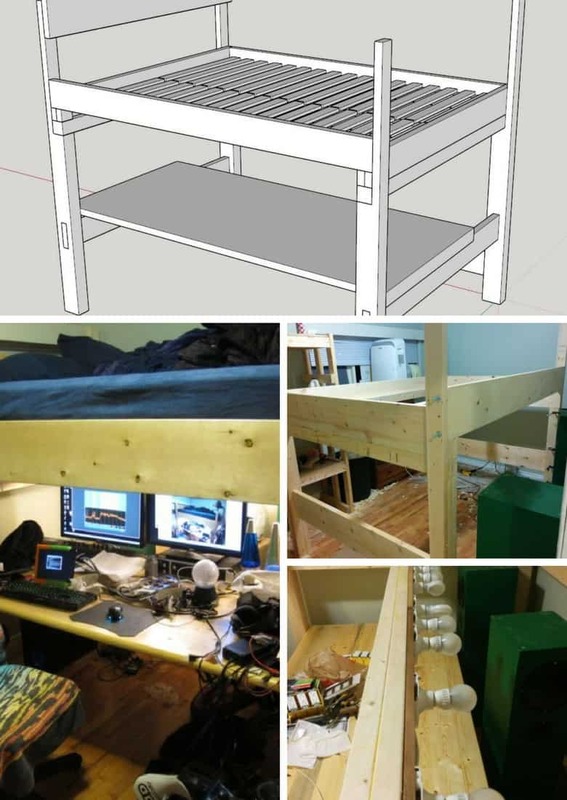 Tools that you may need to build this bed are drill, hacksaw, sander, heavy duty stapler etc. You need to start by dismantling and sanding the parts of the frame of your palette bed. Then you need to measure out and cut the pieces like legs etc. After doing these, now you need to drill the pilot and clearance holes and then use the screws to attach those parts with the main frame. Now, you need to cut and drill the bracket (L shaped steel bracket) and use sandpaper to soften the sharp edge of the brackets. Now, cut and staple the frame and assemble the parts to get your palette bed. A platform bed with drawers can give your bedroom a sleek modern look. You may build this bed by yourself either for standard queen size mattress or you may even choose your customized dimensions, as well. The standard size of this bed will have six drawers that will also save the space of your bedroom. Platform bed with drawer for a queen size mattress will have a physical dimension of 60” by 80”. 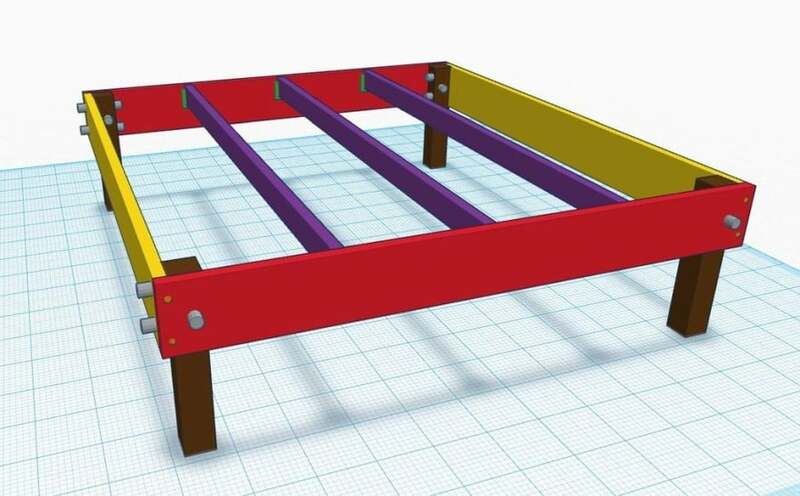 First you need to build the base frame and if you want your mattress to overhang on the ends and the sides of the bed then you should make a frame 50” by 75”. 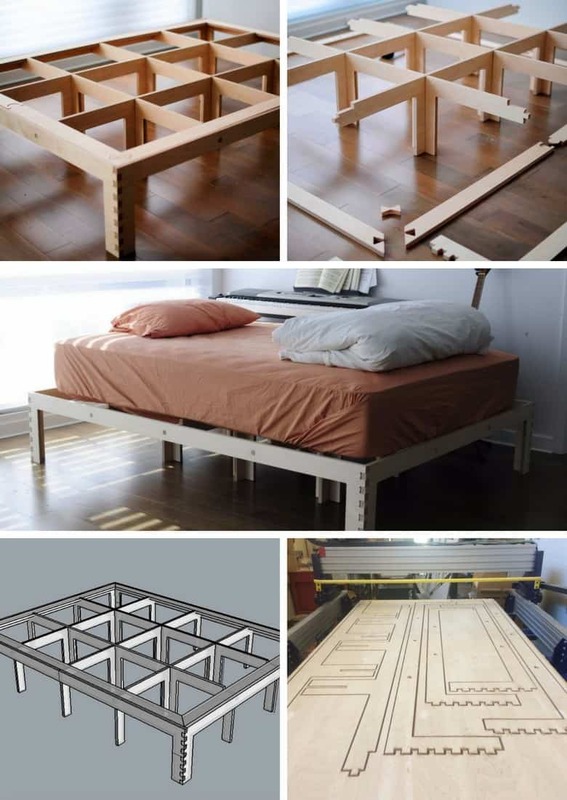 Once you are done with the base frame, move forward to build the bed frame and drawers. Now, you need to install the drawer slides and drawer fronts and assemble the parts to complete your platform bed with drawers. 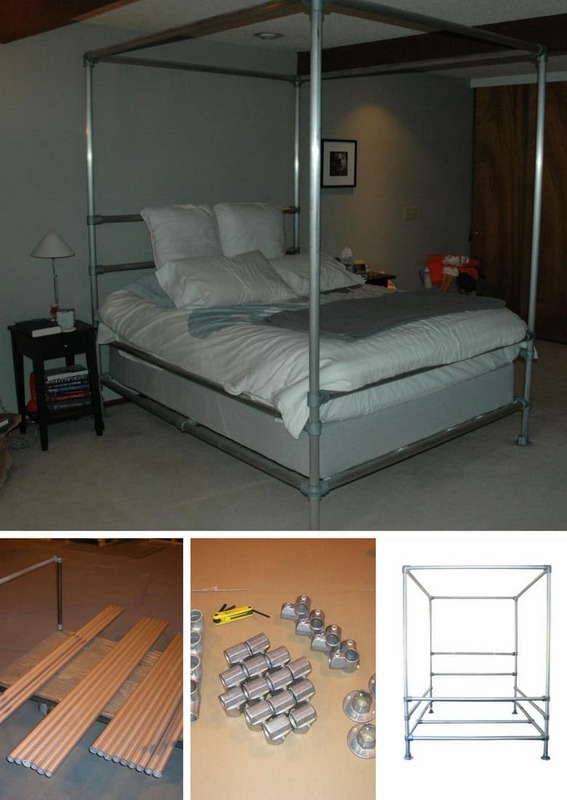 Have you ever thought of building your bed using aluminum pipes and modular fittings? If yes, then this is how you are going to build one such design. 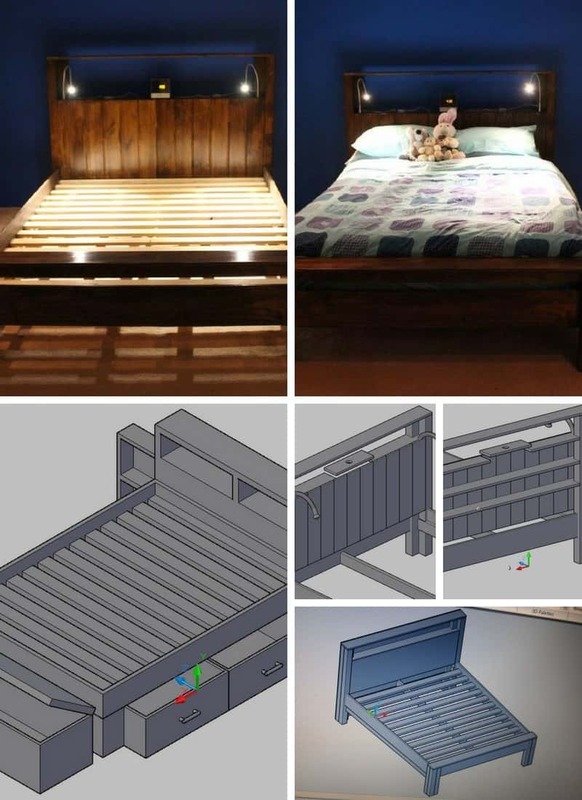 You may find such a concept bed available at some design furniture outlet, but those will cost you around $6000, whereas you can put your hand building your own Aluminum pipe bed which costs around $1000 to $1200. Things you need to build this bed are kee clamp for base, side outlet and single socket joint. In total you need to use 26 clamps. You also need to have 40 aluminum pipe, 19 pieces having a total length of 228”. In addition you also need to use two pieces of angled aluminum. Now you need to weld the aluminum angle brackets and attach the fitting to assemble your own Aluminum pipe bed. Think about a bed which will give a look like having a floating bed. This Do It yourself project will show you how to make your own ground floating bed. First, you need to build the ladder section, which will act as the base frame and hold the upper portion of the bed from the ground. For a queen size mattress, you can consider following 60” by 80’ physical dimension for this bed. You need 12 2X4X8 pine, 8 2X6X8 pine, 2 2X10X5 pine to construct the ladder section. After that you need to construct head and foot bed rails and attach these components with the ladder section using glue and screw. Now, you need to cut the side rails of 83” long using 2X6 lumber. After building the platform, you now need to attach the platform with the frame and then build the headboard. 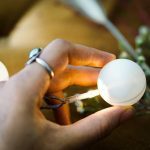 You are almost done, and now you can assemble the LED rope light to give your floating bed a more attractive look. This minimalist bunk bed comes with the most easy to build approach which not only save your bedroom space but also saves you money if you are on your way to build this bed by yourself. 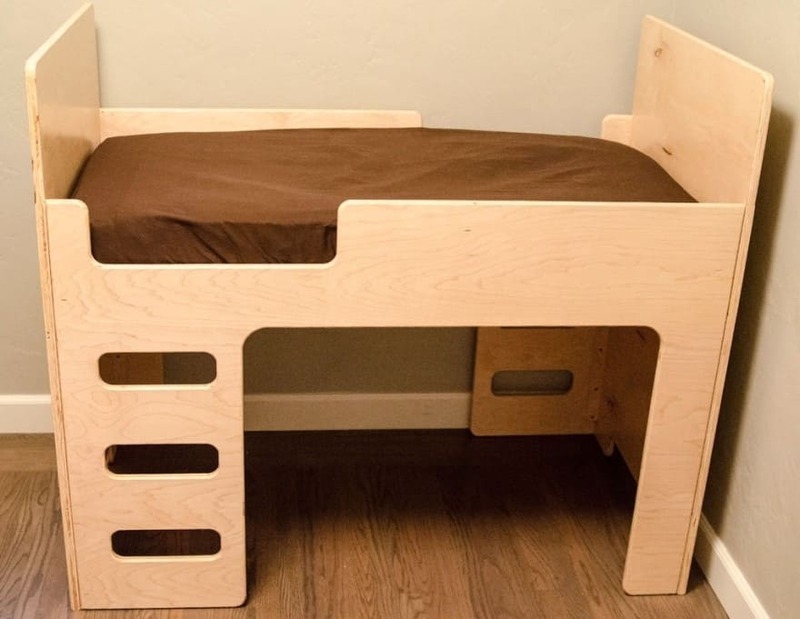 Considering the size of a single mattress, this minimalist bunk bed will cost around $130. You need to have single plywood with a size of 48” X 96”. It is recommended to use ¾” thick plywood and not using any other sheet materials. You need to start with the initial cut to break down the strips and then prepare the notches to support the pieces. After doing that, you need to attach platform support pieces to frame ends and frame sides. Once that part is done, you can now start assembling the outer frames and then install platform support cross braces. Now you can assemble the leg structure and put a layer of varnish coat to give your minimalist bunk bed a nice look. If you are trying to build a simple yet elegant looking toddler bed by yourself then this is the DIY instruction which you may follow. This toddler bed will have a length of 52”. You will also get enough space under this bed and the height of this bed will help you to change the diaper of the toddler, as well. To build this idea, you need two plywood sheets of 4X8’ having a thickness of ¾”, woodscrews and painting materials. You need to cut two scabs having a measurement of 48”X1.5” and six more scabs having a measurement of 24”X1.5”. After that you need to cut five 1.5” strips having a length of 48”. Out of these pieces, two 24” pieces and two 48” pieces will be used to support the main frame where the mattress will be places. Now you need to install the scabs, sand and finish the pieces to assemble your own made toddler bed. 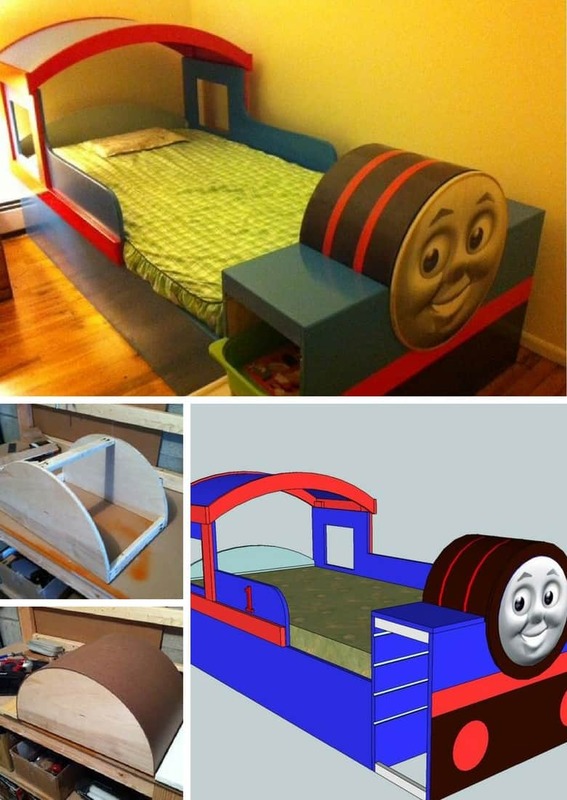 Thomas train bed could be the best design bed for your son. 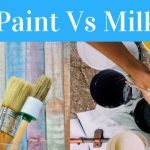 You may find such attractive designs available at different furniture outlet, but you can easily deduce the cost if try to build one by yourself. This description will consider a Thomas train bed for a 39” X 75” mattress. To build this you need one 4X8 and another 4X4 plywood sheet. First you need to make the engine head with a 1/8” hardboard bent around two half circles. Then you can start making the rooftop of the bed using a bit curved plywood. Now you should pay attention to build the bed body which will be made by using two identical pieces cut from the same plywood. The foot board of this bed will be a toy box. 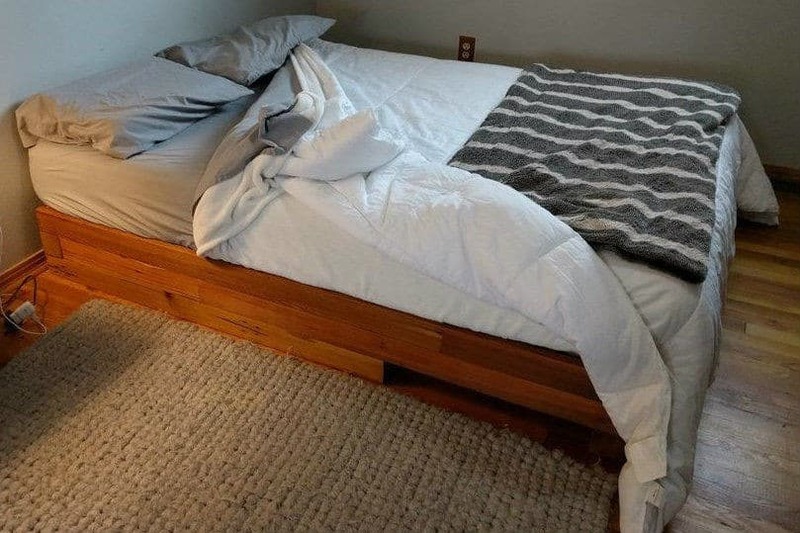 You can use the leftover pieces of the plywood to make the headboard of the bed. 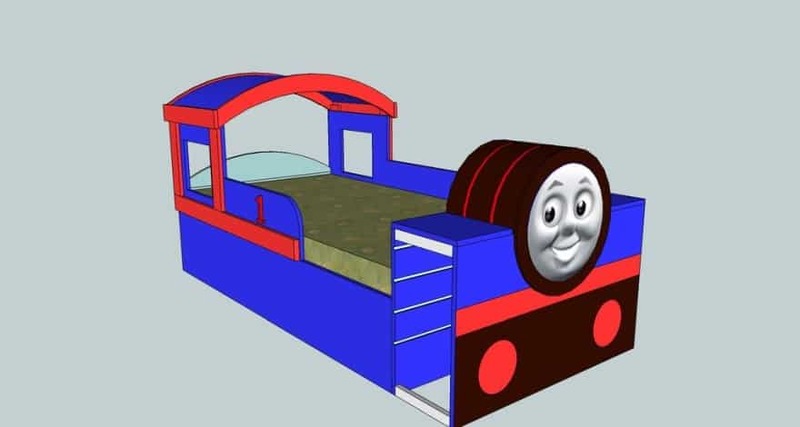 You can then print the Thomas face and paste it on the very front side of the engine and you are ready with your Thomas train bed for your kid. Space saving loft bed could be the best option when you need to manage your sleeping and working environment at the same place. 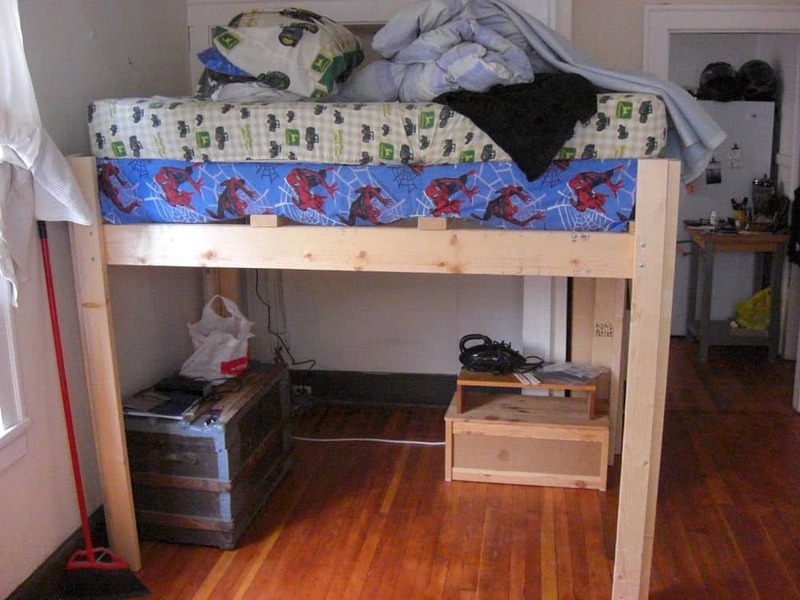 This queen size loft bed will give you a same size specious desk just underneath it. It is important to focus more on the design so that you can maintain a good proportion of height and length while building your own bed. From the lumber yard you can buy some good quality wood to start working on your project. First you need to build the ends and the sideboards using the beams and slats. Then you need to start working on the desk top and install the bulb holders to plug in the LED lights just on top of your desk. 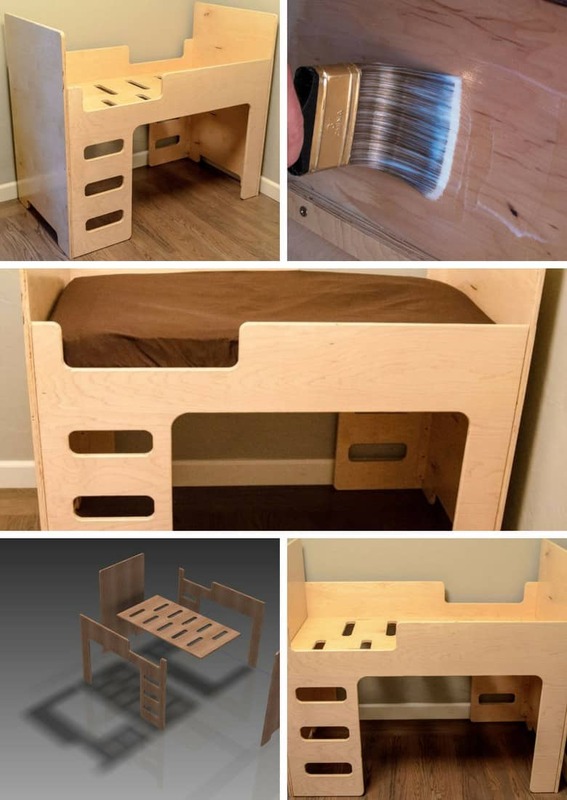 After assembling the desktop, you will find a nice working place having the dimension of your queen size bed and you can put a layer of varnish to add the finishing touch of your space saving loft bed. 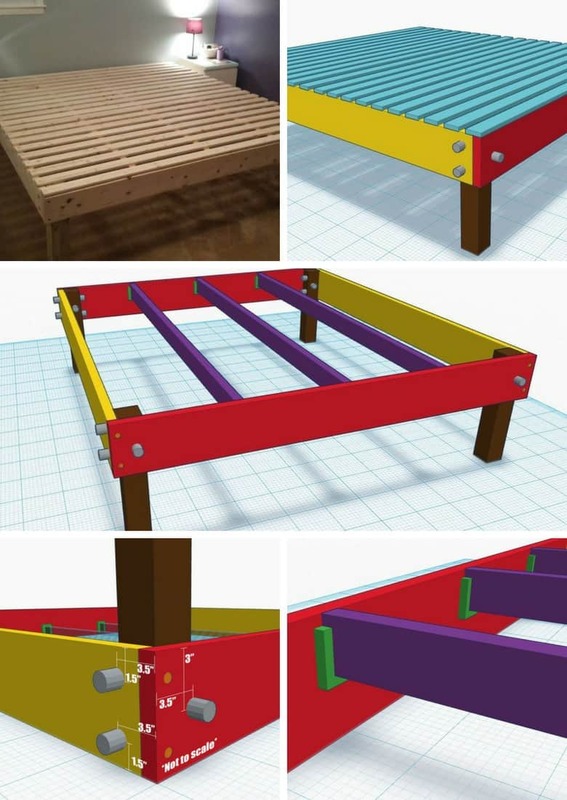 A modern platform bed would definitely cost you more than thousand dollars, but you can give it a try to build your own bed at a much cheaper price. 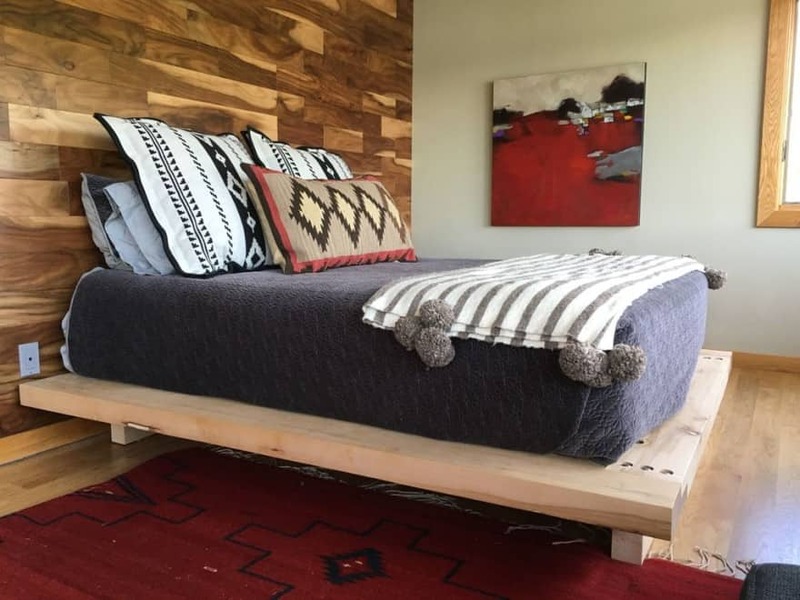 Yes, you can make a modern platform bed using slab wood by yourself. This bed is designed for a queen size mattress hence the main structure of the bed and the joints must have an acceptable fit. You will need a table saw and a circular saw to cut the slab and shape the base frame and supporting frame of the bed. Once you are done with the main structure, you may now join the legs and also join the other edges of the bed using the nuts and bolts. After that you can assemble the other parts of the bed and you are ready with your own massive timbered platform bed. 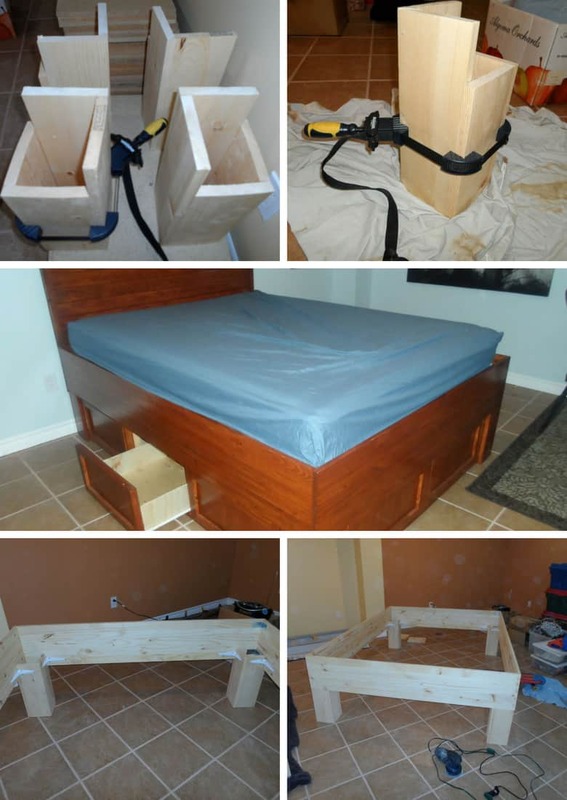 This DIY project is for you if you are trying to build your own custom made bed frame. A queen size standard mattress is considered for building this bed frame, though you may bring changes in the physical dimensions, as per your requirements. You need to have 15 straight and clear 2X4 pine boards and one 4X4 pine board. The base frame will have three supporting slots and you have to use screws to attach those slots with the frame. Once you are done with the base frame and the slots inside, then you need to shape the outer frame and cut the legs following the appropriate measurement. To give your bed a nice look, you may apply one or two layers of varnish and then assemble the legs, the outer frame and base frame together and you are done with a solid and comfortable custom bed frame. 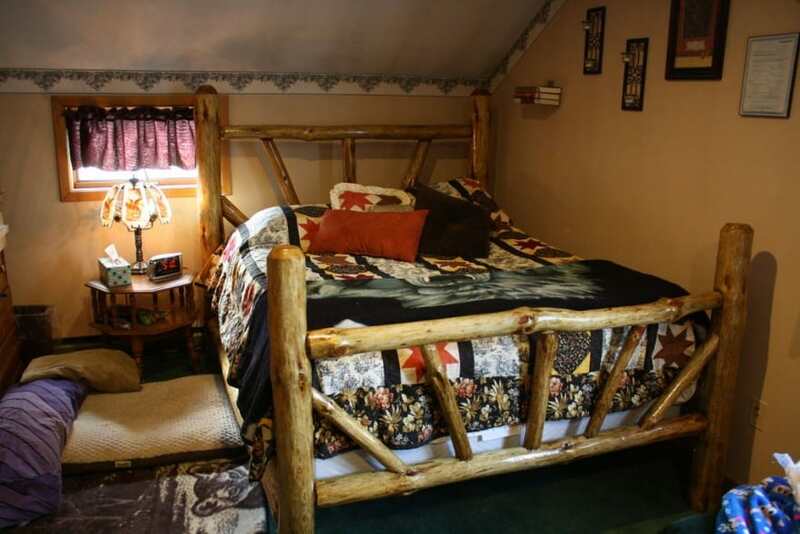 A rustic bed frame is the first choice of many people who want to have a natural look and feel at their bedroom. 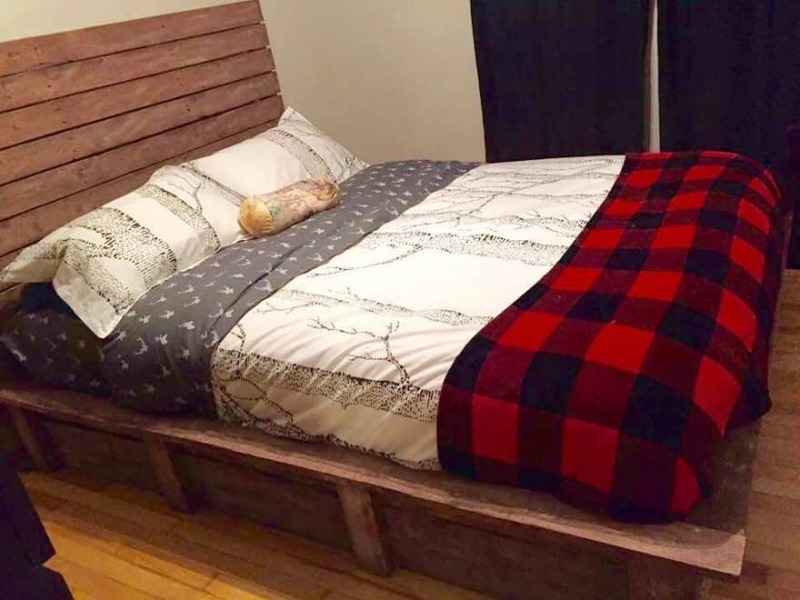 The market price of a queen size rustic bed frame will cost no less than $1000, but you can save money by building your own rustic bed frame at a much cheaper price. It would be great if you can manage to find wood from a golden oak tree. 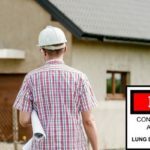 You need to start cutting the tree to make two head board beams, two foot board beams, eight rails spindles, 4 rails, 10 head and foot spindles and 4 connecting rails. After making the pieces, you need to remove the bark and dry those. Now you need to work on the connecting parts between the rails and beams and you need to chisel out the rails to a rectangular shape for this purpose. After that you should start working on the legs of the bed and shape the rail spindles and foot and head spindles. Then attach the spindles with the slats and you are done with your queen size rustic bed frame. 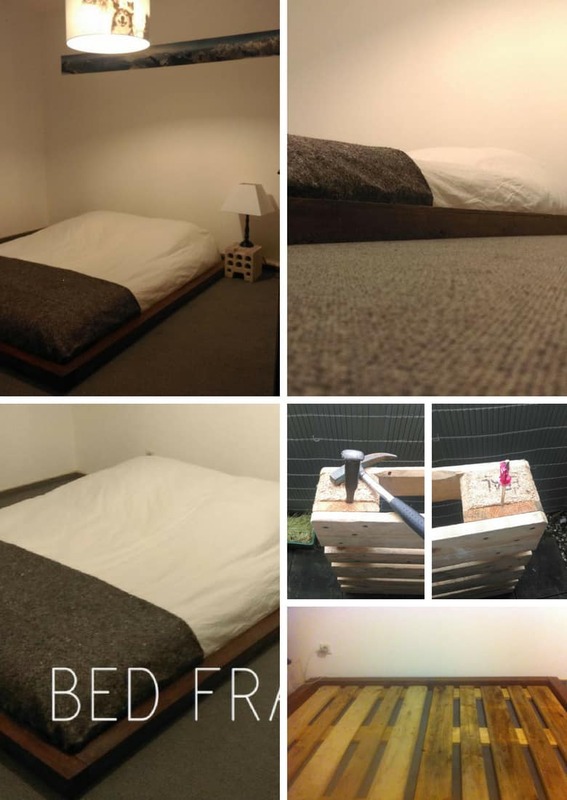 The good news is, you can now build a foam mattress bed frame at a cost less than $100. This bed frame will be built for a queen size mattress with a physical dimension of 76”X80”. 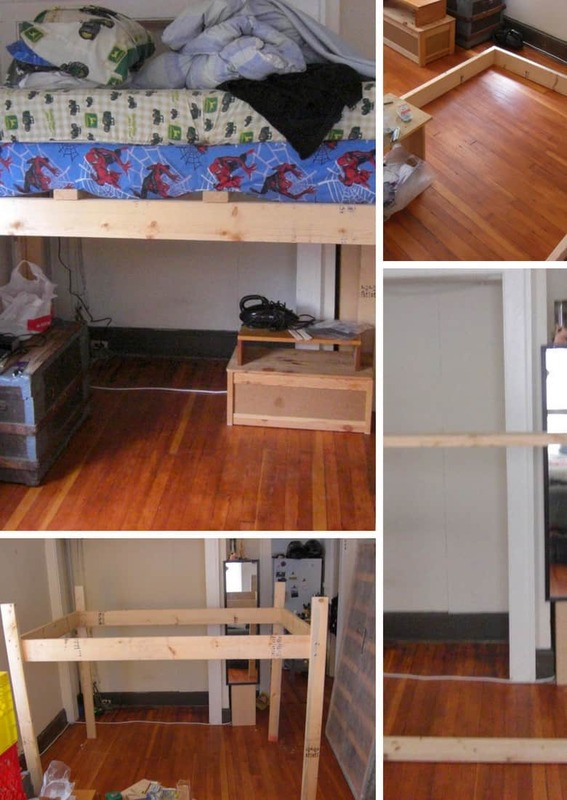 You can bring variation in the height of the legs for this DIY bed frame building project. 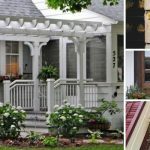 To start this project, you need four 2X6 boards of eight feet length, and one 4X4 post of eight feet length. The tools you need to build this frame are circular saw, hammer, sandpaper, wrench, drill, screwdriver etc. First you need to cut the head and foot of the frame and two sides of the frame from the board. Then you need to cut the furring strips and the posts. Now you have to assemble the outer frame and install the joist hangers on the frame. 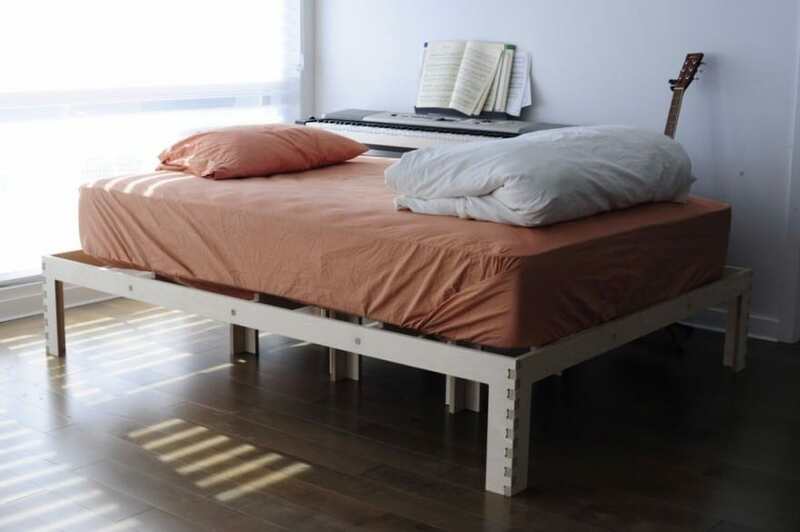 After installing the legs, you can add the slats and you are done with your budget foam mattress bed frame. It is always a good idea to build something useful out of scrap items. 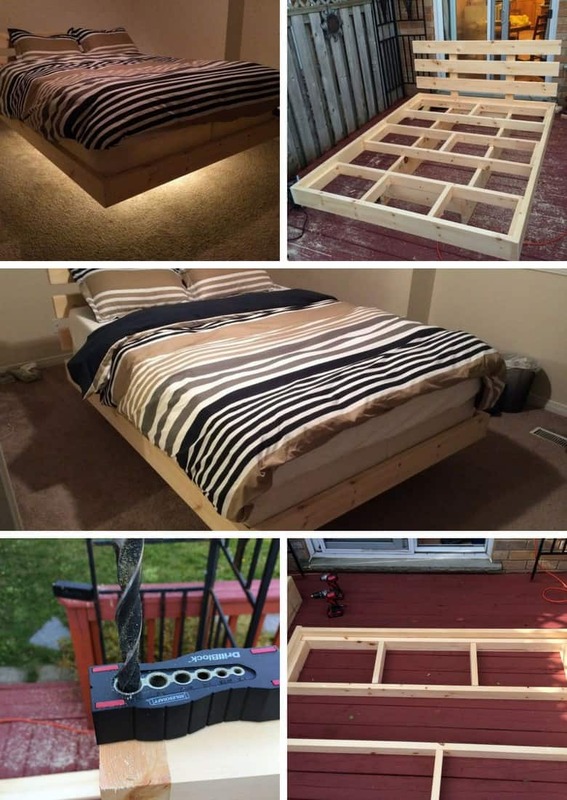 This is one such project where you will be able to build a strong bed frame by using scrap materials. You need to have old cedar fence posts and old desk boards for this project. The tools you need to build this project are belt sander, orbital sander, wood glue, drill, table saw; chop saw, Danish oil and hammer. First you need to clean up the old cedar posts and then make the side walls using those posts. After completing the side wall you need to build the foot-end assembly to give a shape to your bed frame. You need to drill the bolt holes to attach the legs and slats with the main bed frame. 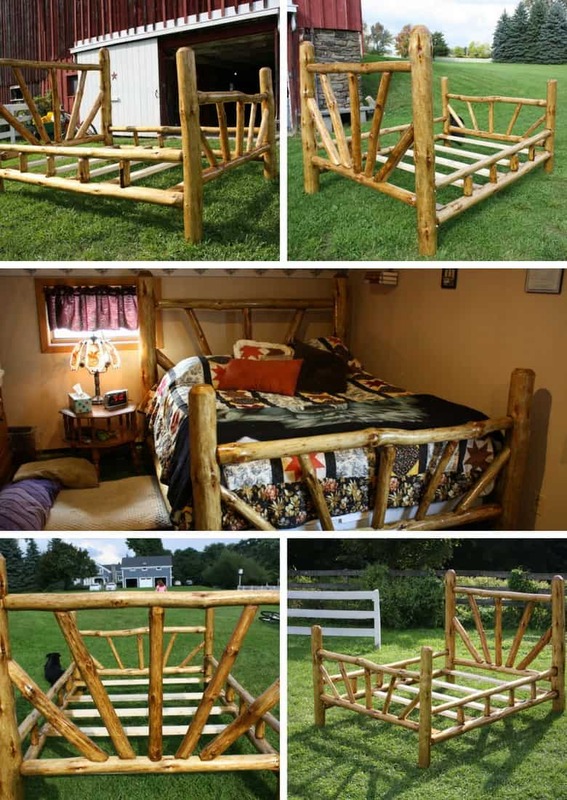 Once you are done with all these, you can start adding some final touches like polishing the frame using wooden varnish to give it a better look, and this is how you can make your own bed frame from scrap materials.